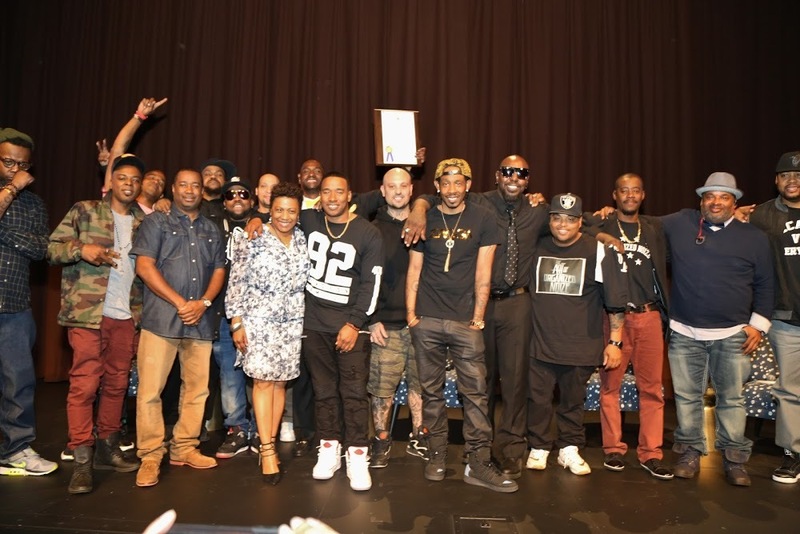 Last Friday, the “who’s who” of Atlanta, joined together at the ScadShow Performing Arts Theater for the private screening of ‘The Art of Organized Noize’ documentary. Hosted by Dungeon Family member and music exec Kawan “KP” Prather, guests were invited for a night of fellowship, an exclusive first look of the documentary as well as sipping on delicious beverages provided by Coca-Cola and cocktails by Martell. As family and friends mingled in the theatre’s lobby, Ray Murray, Rico Wade and Sleepy Brown of Organized Noize were all in high spirits as everyone made their way to the theatre for the main event. As people made their way to their seats, KP welcomed the crowd and thanked them for the continuous support of the super-producing trio. Chants of “Hootie Hoo”, one of Outkast’s early hits produced by Organized Noize, took over the theatre while the lights dimmed, preparing for the show. The Art of Organized Noize chronologized the story of the Atlantan music producers’ rise to success, cultivating not only a sound but a movement and how they were a vessel for some of today’s largest acts such as Outkast, Cee-Lo Green, TLC and Goodie Mobb to express their music. The room was filled with tears, laughter and a sense of pride to be from Atlanta and witness history being made. KP then opened the floor to a Q&A with the group moderated by himself and BMI’s Catherine Brewton, a long-time friend and colleague. “It was an honor to host the screening for The Art of Organized Noize Documentary. Rico, Ray & Sleepy set the tone for a group of young men from Atlanta, who in turn set the tone for an entire era of music. Also, I want to give special thanks to QDIII, Flavor Unit and Orlando McGee of Seventy2 Music for making sure that this story was told”, KP states. The Art of Organized Noize is now available for everyone to watch on Netflix. Notables in attendance: Ray Murray, Rico Wade, Sleepy Brown, Kawan “KP” Prather, Big Boi (Outkast), Mack Wilds, Jason Weaver (actor), Kwanza Hall (Atlanta City Councilman, District 2), Chris Hicks (Head of Atlanta’s Film & Television office), Catherine Brewton (BMI), Big Gipp (Goodie Mobb), Shanti Das (Author of Hip-Hop Professional and former LaFace marketing) Terri J Vaughn (Actress) and Sheree Whitfield (RHOA).